Just in time for St. Patrick’s Day, I thought I would highlight the color green for my color series in decorating. As with all of my color choices for rustic decor, I like to stick with colors that are reminiscent of nature. So, the greens that you will be seeing will be some of the shades that you may see right outside your door. I like the soft shades of sage and the dark muted tones of a black forest green. As far as the green of a clover?….We will save that for your St. Patricks Day decor. It’s easy to simply add some green accessories to a room to give it a little freshness. Plants and floral arrangements do a good job of adding that green. However, I am going to show you some examples of all over room decor where the primary color is green. Martha Stewart has is right with these green accessorizes. Notice how well the pictures and tabletop blend in with the natural floral bouquet. It all looks so serene and peaceful like an outdoor garden. Green in the kitchen seems like such a perfect choice. I had this shade of green on the walls of my last kitchen and just loved them. The color reminds me of a fresh pear or salad – things I may have sitting on those kitchen counters! 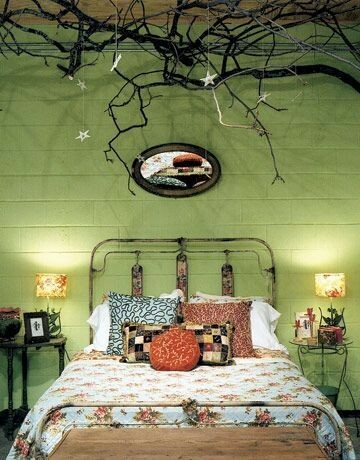 Here is a fun green bedroom that has more than just the color to remind us of nature! The branches across the ceiling pop all the more against the green back drop. Your spa awaits! This darker green looks so rich and inviting. I love how it pops with the white accents. I could easily hang out in this room for a while! It looks so natural to see the green walls with the stone fireplace and other natural elements. Elegantly rustic sums up the description of this room. The muted green tone is relaxing and tranquil. Do you have any green rooms? Do you plan on decorating with green? Let me know your thoughts! 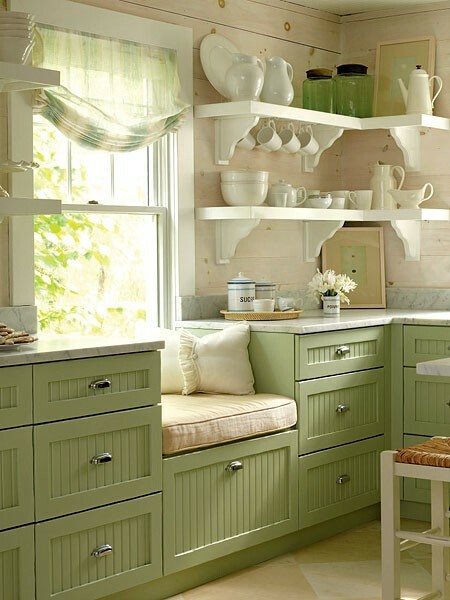 I love the green kitchen! I am planning on using green in my bedroom remodel. Thanks for the ideas for kicking it up. You’re welcome Karen! Good luck with your remodel! What color green is that with the beautiful white tub?